Every year Easter time rolls around and every year I find myself with Mini Cadbury Eggs stocked in my freezer. Because that's how I like to eat my chocolate, right out of the freezer. I have no idea what goes into these tiny little pastel candy coated eggs filled with the most delicious milk chocolate, but whatever it is it's addicting and delicious. So it happened, Mini Cadbury Egg Vanilla Ice Cream and Double Chocolate Chip Cookie Ice Cream Sandwiches were made! I mean it really might be my best ice cream sandwich yet! The ice cream is smooth with bits of crunchy mini eggs and then you have the chewy cookie on top and bottom and holy cow...it's out of this world. And listen I am usually a dark chocolate girl any day of the week, but not with Cadbury Mini Eggs...give me the milk chocolate any day. You like how I tend to use holidays as an excuse for making something not so healthy for me? You are probably starting to realize that every holiday big or small I somehow manage to squeeze a sweet treat in the mix. I like to think that the calories don't do as much damage if you are eating them to celebrate something special. Why should Easter be any different? 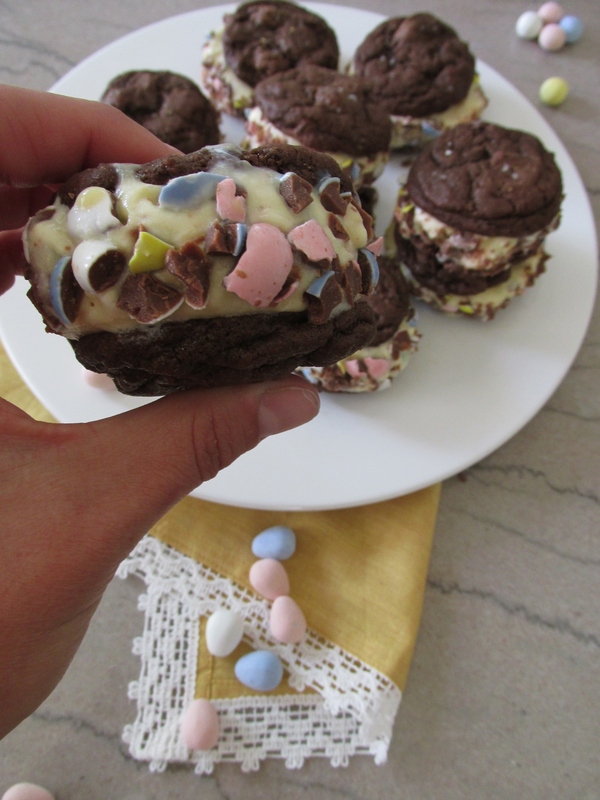 These ice cream sandwiches would be the perfect grand finale to your Easter dinner spread guaranteed to please all of your friends and family! **You will need an additional 1 Cup of Mini Cadbury Eggs chopped for rolling the sandwich when they are done. -Combine your milk and your sugar over medium heat, whisking until the sugar dissolves. -In a separate bowl, whisk together your egg yolks, after separating them from their whites. -Once sugar is dissolved, put a tablespoon at a time of the milk into your egg yolks until they are tempered (which means you are bringing the temperature up so you don't end up with scrambled eggs). -After adding a few tablespoons of the milk to your yolks, add all the eggs into the milk mixture. Continue stirring until the back of a wooden spoon is coated. You should be able to run your finger down the back of it and see a line. -In an airtight container, pour your heavy whipping cream into it, and then add your thickened milk mixture. Stir well and seal the container and refrigerate overnight or a minimum of four hours. -Follow ice cream maker directions from there. Once your ice cream has started to become a soft serve consistency, add your chopped Cadbury eggs and let ice cream finish. Freeze overnight. -In a large bowl sift together your flour, cocoa, baking soda and salt. -In another bowl beat your butter and sugars together until they are fluffy. -Add your egg and vanilla and continue to beat until thoroughly combined. -Add your dry ingredients a little at a time until all is combined. A wooden spoon works best here as your batter will be thick. -Fold in your chocolate chips. -Refrigerate your dough for 30 minutes. You could also do this overnight. -Drop tablespoon size dough onto a parchment or silpat lined cookie sheet. Sprinkle with sea salt. -Bake for 8-10 minutes until cookies just set. Transfer to cooling rack. **After your ice cream has frozen overnight, place once scoop of ice cream between two cookies and press lightly. 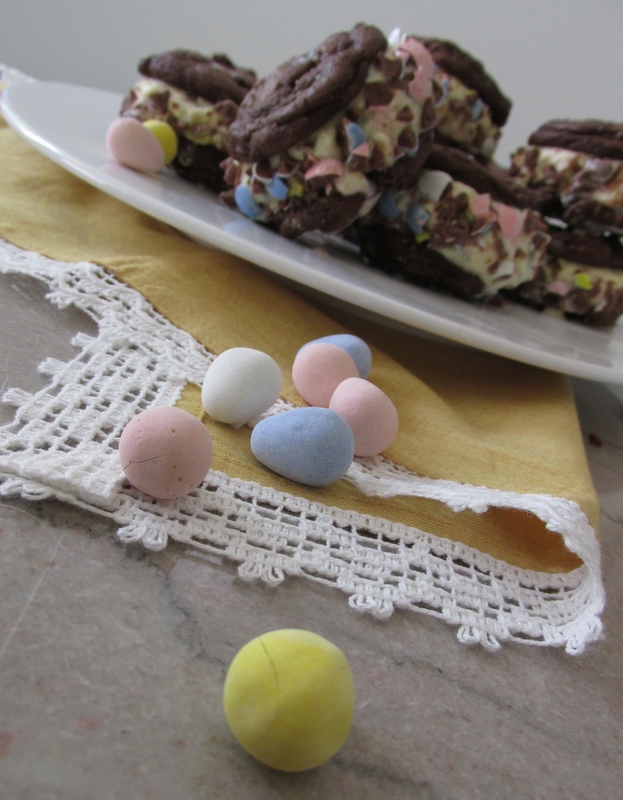 Roll the ice cream part of the sandwich in your additional chopped mini eggs until all has been coated lightly. My weakness for ice cream and Mini Cadbury Eggs is ridiculous, so needless to say I had to bring these sandwiches to a crawfish boil that we had this weekend, otherwise I would eat every single one of them...yeah, they are that good! But I can tell you what would not be good, and that's if I ate them all! That might be borderline embarrassing not to mention I would have to go up a pant size. What's your favorite Easter time candy? Are you a peeps fan or a Cadbury fanatic like me? Regardless, one thing is for sure, I can guarantee that you will love these ice cream sandwiches!